Ancient Rome's port of Ostia, now landlocked five kilometers from the Tyrrhenian Sea, is Italy's largest excavation after Pompeii. Visiting Ostia from Rome couldn't be easier, whether you make the half-hour journey by direct train or with a full- or half-day guided tour. Ostia was founded about the fourth century BC a short distance from the city at the mouth of the Tiber, and became the principal Roman naval base, growing to a thriving city of 50,000 inhabitants. From being Rome's largest suburb and its commercial port, Ostia fell to disuse and malaria after the fall of the Roman Empire. The excavated city, which dates mainly from the second to fourth centuries AD, gives a vivid picture of urban life in Imperial Rome. Public baths were a central feature of Roman towns, large facilities that served both social and hygienic purposes. Like most bathhouses of that period, these are richly adorned by mosaic floors. The sea theme of the baths, with fish, mermaids, and Neptune gives them their name. From the terrace at the northeast corner, you can get a good view of the heating system that kept the proper temperatures in the various sections. At the end of Via dei Vigili, on the left, are the Watchmen's Barracks from the second century AD, with a large central courtyard. Adjacent to the Baths of Neptune is the semi-circular theater, originally built in the time of Augustus and later enlarged to seat 2,700 spectators. From the highest tier of seating there is a good view of the excavations, particularly of the open Piazzale delle Corporazioni immediately north of the theater, where you can see the columns of the Temple of Ceres. Along the east side of this square are the offices (scholae) of the various shipping corporations trading with overseas ports, mainly in Africa. To the west of the theater is the House of Marcus Apuleius Marcellus, a second-century home with a peristyle and atrium similar to those found at Pompeii. Adjoining it on the north is a shrine of Mithras. Standing on a high brick base and with large sections of its brick walls still erect, the imposing Capitolium was the religious center of the town. Partly because of its elevation, this second-century structure was the only building of ancient Ostia that remained above ground throughout the Middle Ages. To the south of the Capitolium is the Forum, in the center of town at the intersection of the Decumanus with the Cardo Maximus, the principal transverse street. On the south side of the Forum, you can see the remains of the Temple of Roma and Augustus, from the first century AD, with a statue of the victorious Roma. To the west, beyond a basilica, is a third-century rotunda in the style of the Pantheon, and southeast of the Forum are large second century baths. The Decumanus Maximus, the main street of ancient Ostia, more than one kilometer long, starts at the Porta Marina, close to the ancient shoreline. It runs the length of the town, and along it are most of the major public buildings, along with shops and businesses. Look just before the street makes a slight bend to the right, opposite the intersection of Via della Foce, for a fishmonger's shop, recognizable by the stone table for cutting fish. Farther along the Decumanus Maximus on the left is a well-preserved Thermopolium, a stone counter containing basins for cooling drinks and tiers of shelves to hold drinking vessels. Opposite are the easily recognizable public latrines. Four small temples built on an older substructure are on the left before the theater. The barrel vaulting in the bakery was most likely built in the Severan period, sometime between AD 193 and 235, useful where there are ovens as they slow down the cooling and do not catch fire as easily as a wood-beamed ceiling. The bakery is, not surprisingly, opposite the large store buildings for grain, the Grandi Horrea, dating back to the reign of Claudius. Basalt blocks with imprints of hooves suggest that the animals turned the millstones used for grinding the grain, and a number of millstones were found here, made of volcanic stone from Orvieto. An oven made of tufa stones on top of a brick base is almost five meters thick. In a road running parallel to the Cardo Maximus, west of the forum, the Horrea Epagathiana is a group of impressive privately-owned warehouses. The gateway is in excellent condition, and the area has a two-story arcaded courtyard. Opposite, the Domus di Amore e Psiche is a typical dwelling with an inner courtyard and a well-preserved marble floor. Just beyond the main entrance of the excavation area, along the ancient Via Ostiensis and the parallel Via delle Tombe to its south, are rows of tombs. The most impressive of these are on Via delle Tombe, but both streets are lined with individual tombs, some quite large, and columbaria with niches for large numbers of urns. 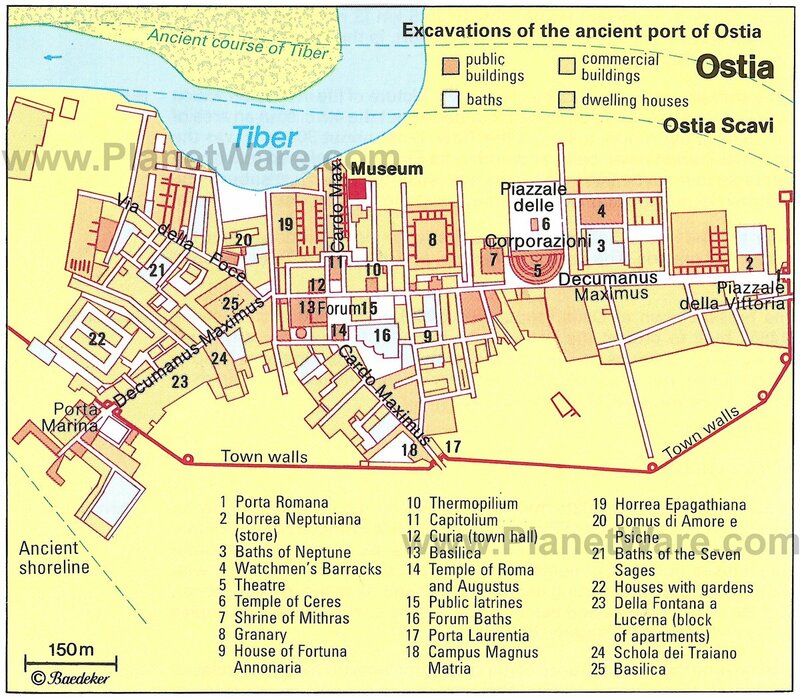 Via Ostiensis leads to the remains of the Porta Romana, the most important of the town's three gates. Just inside the Porta Marina is the 108-meter block of apartments known as Della Fontana a Lucerna, with shops on the ground floor. The mosaic floors and heated bathrooms suggest that these apartment blocks were built for affluent residents. Across the Decumanus Maximus lies a large area of houses with gardens. The building housing the museum dates back to the 15th century and is known as the Casone del Sale (Big House of Salt), referring to the salt pans that were once along the marshes at the Tiber's mouth. The museum displays finds from the excavations that tell more of the story of the lives of Ostia's residents. Two rooms are dedicated to the oriental cults popular in ancient Ostia, illustrated by reliefs carved into coffin lids showing priests conducting ceremonies, and a large marble group of Mithras slaying the bull. Among the museum's highlights are a large marble statue of Minerva that was probably from Porta Romana; a relief from the Temple of Hercules dating from between 80 and 65 BC; a statue of Perseus holding the head of Medusa found in a villa outside Porta Laurentina; and a portrait of Trajan, a rare masterpiece that was found in the theater. The name of the present town, Ostia Antica, is a bit misleading as it is a great deal newer than the adjacent excavated town. It is dominated by a castle, built in 1486 to protect the harbor. The castle is triangular, with heavy walls, bastions on the side facing the river, and a massive keep in typical Italian Renaissance fortification style. The Renaissance church of Santa Aurea was built at the same time. The lido (beach) at Ostia is popular with Romans escaping the city's heat in the summer. Although you can visit Ostia Antica independently from Rome on the frequent commuter trains from Ostiense, part of the Piramide Metro station, it is often easier and more rewarding to take a tour of its top attractions. Not only is the transportation from Rome included, but you'll see the ruins with a knowledgeable guide who can help bring the ancient city to life. Full-Day Trip to Ostia from Rome: If you want an in-depth tour and are looking to understand the history of Ostia, the Ancient Ostia Small Group Day Trip is your best option. You'll join other tourists and your guide at the Piramide Metro station to travel by train to Ostia for a walking tour through the ruins and museum, with time in the afternoon to explore on your own or sunbathe on Ostia's beach. Half-Day Trip to Ostia from Rome: If you're not up for a full day of Roman ruins, you might want to try the Ostia Half-Day Trip, which takes about four hours round-trip. Arriving at Ostia on Your Own: If you choose to go independently, the commuter train to Ostia is included in the daily transport passes for Rome's Metro and buses. The entrance to the ruins is a short walk (well signposted) from the Ostia Antica rail station, and audio tours are available in English.